Britain's Duchess of Cambridge reportedly likes Prince George to have "a good old rough and tumble". The king-to-be will turn two later next month and enjoys running around and playing already. 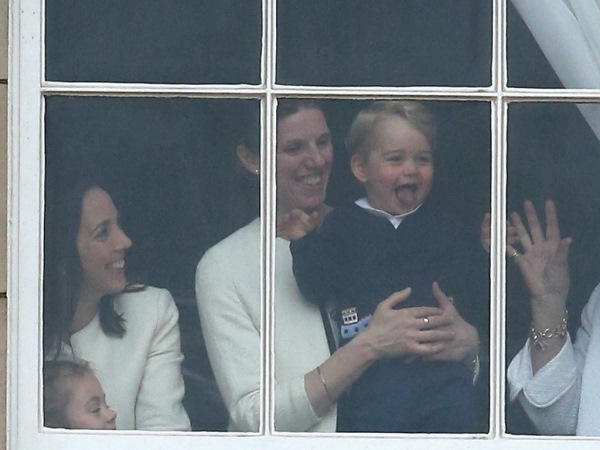 This was evident on Saturday when he was pictured sticking out his tongue in delight when he spotted his mother, Catherine, at the annual Trooping of the Colour ceremony. The following day he was pictured out with his family at a polo match, with the toddler seen kicking a ball, dancing and climbing around with friends including 18-month-old Mia Tindall, whose mother Zara is George's father Prince William's cousin. "[Catherine] was running after him and making sure he was interacting with the other children," veteran royals photographer Mark Stewart told People. "She wasn't being precious with him – she wanted him to have a good old rough-and-tumble." George has just become a big brother following the arrival of the couple's daughter Princess Charlotte at the beginning of May. Catherine is apparently planning to take more time off from royal duties this time around and she is determined for her kids' upbringing to be as normal as possible. Having two children isn't without its trials though, especially as George has reportedly been rushing around a lot as he's so full of energy. "George seemed to be a handful – a live wire," Mark remarked. In fact the prince is so busy all the time Catherine apparently finds it hard to get any time for herself. She certainly doesn't seem to mind though, as she looked relaxed and happy in skinny jeans and a striped top at the polo match. Luckily the beauty has some help with her children in the form of nanny Maria Teresa Turrion Borrallo, who was pictured holding him up to a Buckingham Palace window at the Trooping of the Colour.